This entry is part 14 of 23 in the series Portugal & Andalusia 2012. When I first started planning our trip to Portugal and Andalusia, there was one place I absolutely had to visit – The Alhambra and Generalife; a stunning palace complex, complete with spectacular gardens, perched in the hills of Granada, Spain and a UNESCO World Heritage Site to boot. Every region has its over-hyped tourist attractions. You know the ones I mean – swarming with travellers, pointing expensive camera equipment at each other and surrounded by tacky shops selling that same attraction printed on anything you can think of. More often, tourist sites we visit are worth the trip. We’re glad we visited and may even consider returning if we happen to be in the area again. But we wouldn’t necessarily go back just to visit that one site again. Occasionally, however, a tourist attraction goes beyond the hype. It’s worth the long lines and high ticket prices. It touches you in a way you can’t even process until long after your visit. 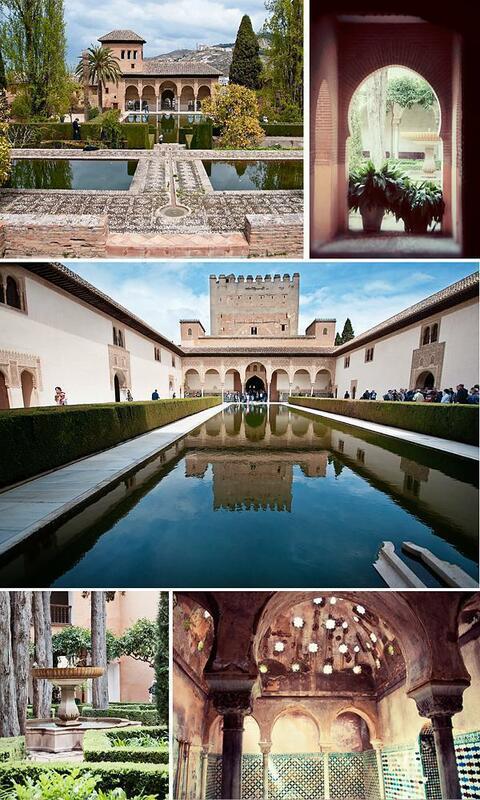 This is how it was for me with the Alhambra and the Generalife. View of the Alhambra, from the Mirador de San Nicolás, in the Albaycin of Granada, was our first glimpse of this magnificent complex. Despite my desire to see the Alhambra in person this year, it almost didn’t happen. The ticket reservation system is complex and frustrating and we weren’t able to book in advance (we highly recommend buying tickets online weeks in advance, if you plan to visit). We were forced to take our chances getting up early and standing in line. It was a hot morning and my mother was sick. We almost decided to pack it in and head back to the hotel. Luckily, my Mom is a trooper and toughed it out. We managed to score four tickets from the automated machines on site and our visit could begin. Once inside, in the shade, my Mom felt better and the rest of our day was perfect. The Alhambra is a huge complex of Moorish palaces. Badis ben Habus, the Berber ruler of the Kingdom of Granada in al-Andalus, began constructing the first palace in the mid 10th century. Over the years, the Alhambra expanded, as palaces were built for the last Muslim Emirs in Spain and its court, of the Nasrid dynasty. After the ‘Re-conquest’, by the Christian rulers, in 1492, the palaces were repurposed and, in 1527, the Palace of Charles V, was built for the Holy Roman Emperor. As with the Alcazaba of Malaga, Spain, the Alhambra fell into disuse and wasn’t ‘re-discovered’ until the 19th century. 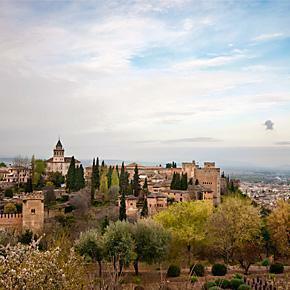 Restoration began and the Alhambra quickly became one of Spain’s most popular tourist destinations. So out of all the castles and historic sites we visited in Andalusia, why is this one so special? 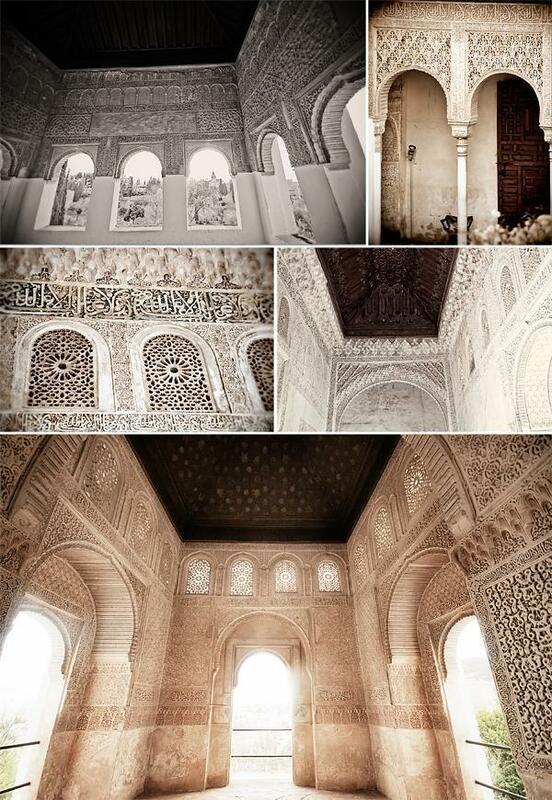 Its troubled history and the myriad facts you read, about the Alhambra, do nothing to prepare you for your visit. We spent close to a full day exploring and photographing the site and I feel we hardly scratched the surface. The details are incredible and each palace is more spectacular than the last. It’s impossible to translate this all to words and images, however, I hope the following photos give you a taste of what we experienced. We began our tour at the Generalife Palace and gardens. This complex was constructed as the recreation area for the Kings of Granada to escape the routine of official life. 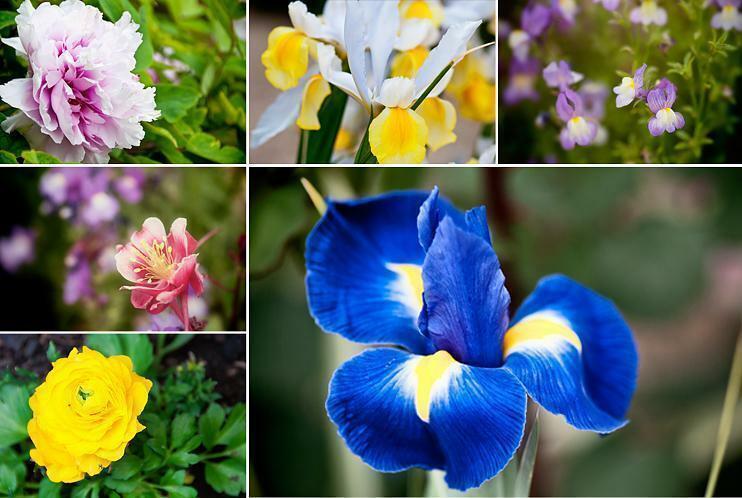 For garden lovers, like my mother and me, the Generalife is a paradise of colourful flowers, magnificent hedges and the ever present trickling water features. 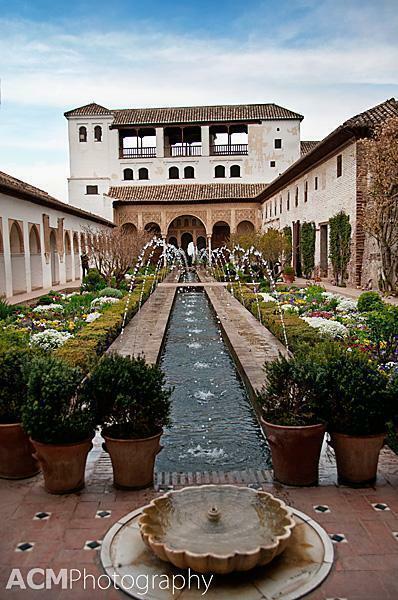 Splashes of water from the Generalife’s water features and striking garden architecture. The interior of the Generalife Palace was just as striking as the architecture of the gardens surrounding it. Because the Generalife was built at a higher elevation, it also offers magnificent views of the Alhambra and the surrounding mountainsides. An army of gardeners maintains the gardens of both the Generalife and the Alhambra. We stopped to watch, with fascination, as this gardener shaped the hedges into elaborate topiaries. From the Generalife, we headed to the opposite end of the Alhambra complex. Here we found the Alcazaba, one of the oldest parts of the palace. This is the military area and here you can walk along the fortifications and visit the various watch-towers. 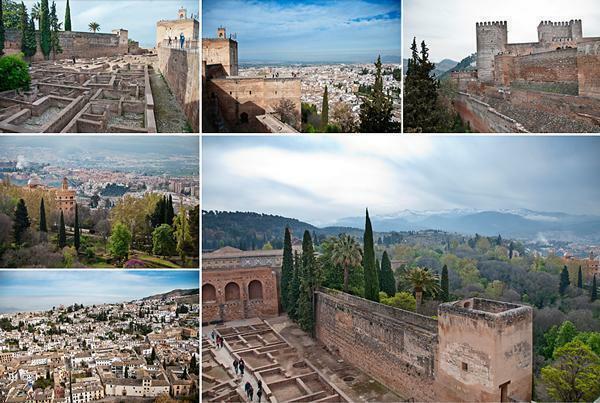 The Alcazaba – the military complex of the Alhambra and the views from its ramparts. 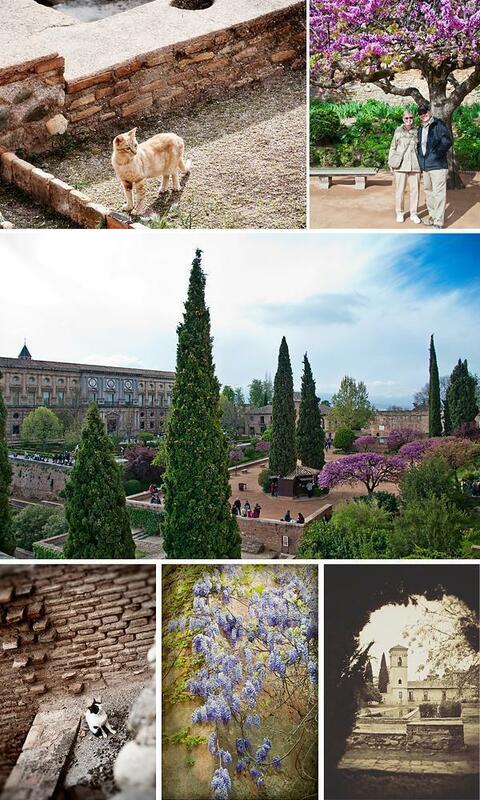 A few of the cats living the good life in the Alhambra, my parents enjoying the spring blooms and the Plaza de los Aljibes with the Palace of Charles V in the background (main image). Our next stop was the Palacio de Carlos V (The Palace of Charles V). Inside we found the excellent Museum of the Alhambra. There are volunteer guides here who will take you through the entire exhibition free of charge. Ours turned out to be a retired professor who was a fascinating lady. The circular courtyard in the centre is particularly striking. The circular courtyard of the Palace of Charles V and some colourful visitors I couldn’t help photographing. We had saved the best for last. Our final stop was the incredible Nasrid Palace complex. This area contains three palaces built in different periods: The Mexar Palace, the Comares Palace and the Palace of the Lions. 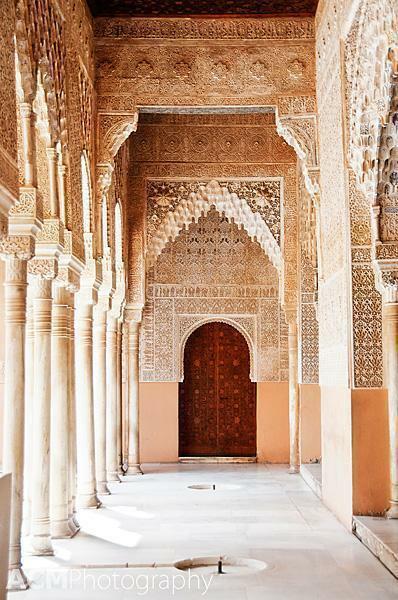 The Nasrid Palaces are particularly known for the intricate and lace-like arabesque stonework. Each carved detail is more elaborate than the next. The mostly white carvings are set off by colourful detailed tile work. Of the three palaces, my favourite was the Palace of the Lions. Unfortunately, when we visited, the famous Court of the Lions fountain was under repair. Even so, the Hall of the Kings and the Hall of the Abencerrajes took our breath away. This Mocárabe (also known as Honeycomb or Stalactite) ceiling in the Hall of the Abencerrajes was one of the most breath-taking sights of the day. [Centre] The Patio de Arrayanes (Court of the Myrtles), [Top] Palacio del Partal (Partal Palace) and the [Bottom] Arab baths. 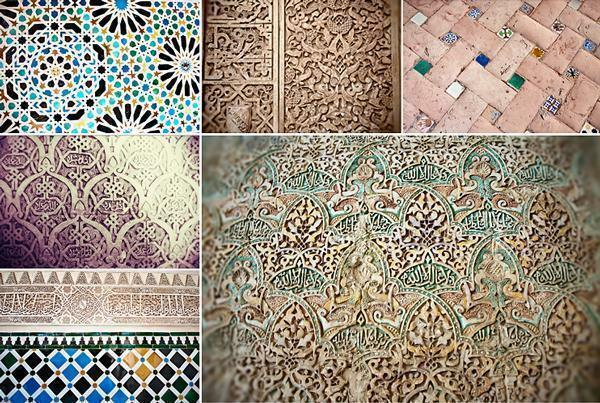 This is just a small sample of the hundreds of photos I took inside the Alhambra and the Generalife. I hope they tempt you to brave the crowds and make your own visit. 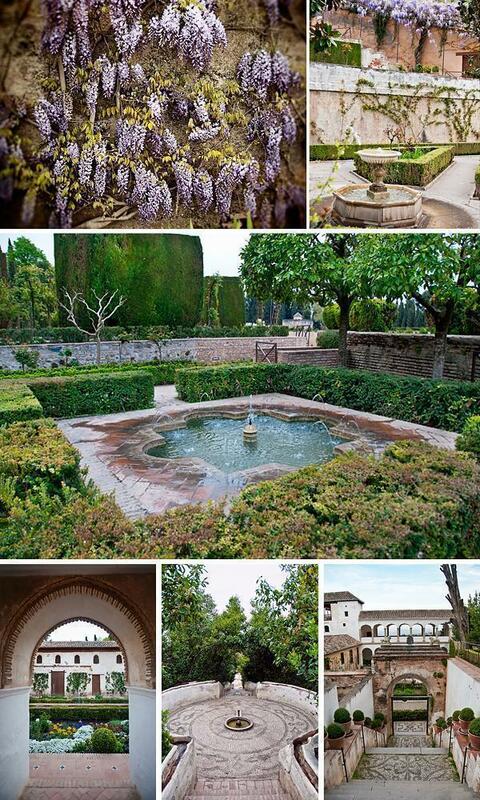 Plan a minimum of 3 hours for your visit to the Alhambra, more if you plan to spend time at the Generalife gardens. If you want to visit the Nasrid Palaces you can only enter at the specific time printed on your ticket, so line up at least 5-10 minutes in advance. The site is large and there are stairs and rough trails in parts so wear comfortable shoes. Get up to date information on opening hours, tickets, and fees on the official website of the Alhambra. Use the Official Ticket Booking Website to order on-line. (Tickets are also available from a variety of tour companies but do your research before booking through un-official channels).